about the different phases in a player's development, why they occur, and what you have to do to master them One of the worst and most crucial situations in a player's development is when he experiences his first real crisis -- the first slump. Beginning players usually develop quite fast, especially when they possess a lot of talent. They can start like a rocket, reaching a tremendous first high just out of nowhere. They start to get far in tournaments. If talent allows, they even win some, but then after a short time things get stuck. Their level of play decreases, and sometimes their star sets as fast at is has risen. Some of them quit play -- we never see them again. Those who stay in the tournament scene are likely to become one player among the many who do well on occasion but never make it to the real top. But a few of those talents manage to cope with their setback. They get good results again, and sometimes you will find them battling with the big shots later. So what went wrong with those from whom we don't hear again? "Personal reasons," you might say: a girlfriend, marriage, children, job, and so on. Okay, that's a point. Another point is that most of them got frustrated because their game didn't improve with the same pace as before -- it even got worse, and they couldn't explain why. In most other sports they would have had a trainer who told them that this is not a catastrophy, that it is normal, and it has a name: The First Slump. In darts there are very few trainers (are there any at all? ), so players have to rely on themselves. So it is very likely that they will face problems that wouldn't appear with proper guidance. In this article I want to give you a guideline for a player's development by introducing the 5 phases of darting progress. Each phase has its unique features and typical problems. By working through it you should be able to categorize your own stage of progress in one of these phases, and I hope you will then be able to better understand what is going on with your game, and have a guide on how to step a phase up. This is of course a simplified sketch of the playing progress. A curve taken out of "real life" (e.g. from a player's marks per dart average taken every league night) would never be that smooth and evenly distributed. The sketch just shows a general trend. One thing you might miss is a timescale on the "experience" axis. This is intentional, because this timescale is an individual variable depending on specific persons. For instance, a majority of players go through all of these stages, no matter on which level they end performing (with the one exception for players that don't get beyond their 1st slump, but more on that later), but how much time players need for this process is very individual. For example, Eric Bristow needed less than 10 years from throwing his first dart to reach expertise, but Dennis Priestley needed 25 years until he suddenly popped into the professional scene by winning the Embassy World Championship as an underdog who first had to qualify for the event. Personally I believe that it will take at least 5 years to go through these stages, starting as a beginner to reach expert level. 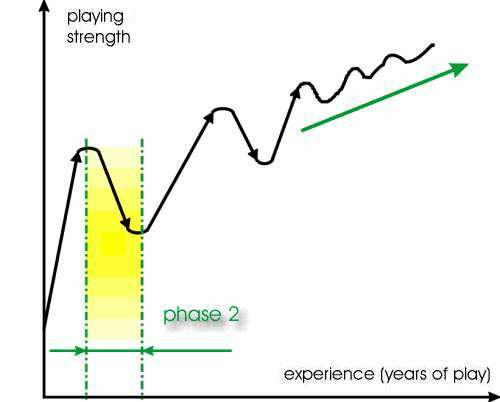 The phase between the start of serious dart playing (entering a league or tournaments) and the first peak. This usually is the shortest of all the phases, and it is determined by a fast and steady increase of playing strength. 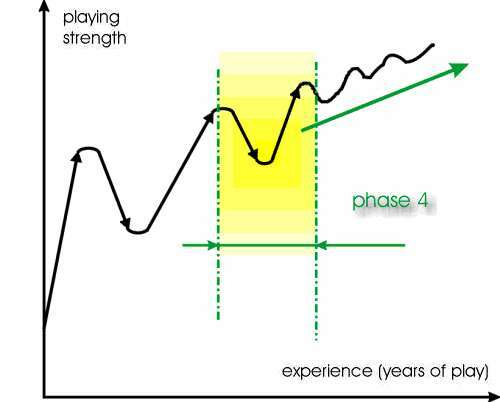 This phase starts immediately after the first peak and is determined by a sudden and huge setback in playing strength. Generally speaking, the higher the first peak, the worse the drop in play. The end of phase 2 is determined by the standstill of this setback, either because it "can't get any worse" or because the results are getting better slowly but steadily. Players whose results don't get better for many years after the first peak and the huge setback afterwards are among the many who are stuck in this phase. They are usually frustrated and practicing hard without success, or they have accepted that darts isn't their sport and play socially or have quit completely. This phase is characterized by many ups and downs, with a slight general tendency up. This phase can also last for years, but usually doesn't take more than 1-3 years. Players in this phase have gone through the first slump and are working hard to improve, which starts to pay off. After working hard, the player has reached a 2nd peak, higher than his first peak. He plays better than ever, but now a second slump is awaiting him. Not all players go through this phase, but those who do will find themselves in a situation similar to the first slump. Because they have gained experience through phase 2 and 3 it is now much easier for them to fight this 2nd slump, and they will reach another high soon afterwards. The final stage for a dartplayer. He has gone through many ups and downs. 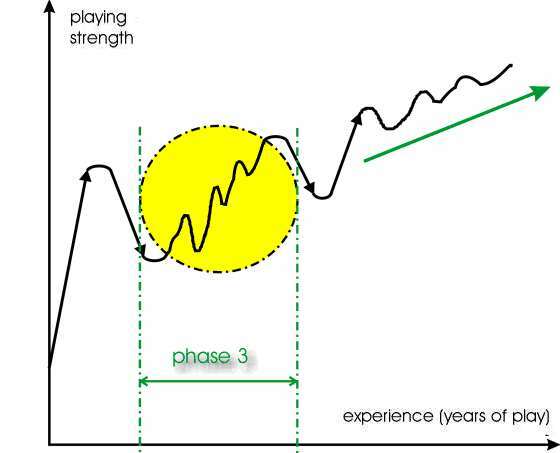 If he reaches that phase this means he has gained a lot of experience by going through all the other phases. There still are ups and downs to recognize, but they are no problem any longer because he knows how to handle them. If he is a serious and dedicated practicer and competitor, every level of play is open to this player. He has become rock-solid and will have all chances to win against the big guys in the sport. Dia 2: First phase of a player's career - "The Rocket"
A dartplayer possesses talent -- some more, some less. This determines the starting point at the beginner's level, and usually the height of the first peak, but NOT MUCH MORE! It especially doesn't mean that a great talent will have no problems during further progress. Actually, the opposite is true! A beginning player improves fast. First, because there is, of course, every possible chance for improvement because he just plays bad (he is a beginner, so why should it be different?). Second -- and much more important for understanding the problems we will find in later phases -- because A BEGINNER DOESN'T THINK MUCH OF WHAT HE DOES, HE JUST PLAYS. Haven't you heard that somewhere? Don't think too much in darts, just play. A beginner does exactly this, mainly because he can't think of things to think ( this should sound familiar to you). For example, if you are an experienced player, have you ever shook your head on beginner's finishes? Not the fact that he plays wrong numbers and bad doubles, but the fact that he HITS THEM in a way you never will. That's just the kind of carefree mood that's great for hitting. So "The Rocket" reaches a first peak that can be tremendous if a lot of talent is involved. 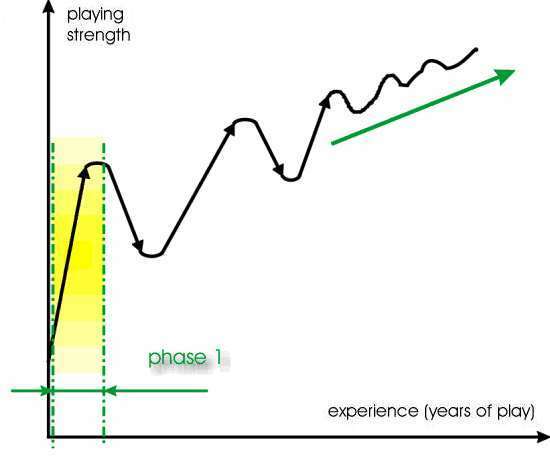 Less talented players may develop slower -- their curve in phase 1 is flatter, and their first high is much lower, but the curve still is increasing steadily with setbacks completely missing at this stage. Phase 1 is usually the shortest of all phases (only phase 4 is likely to be shorter, sometimes missing completely). It shouldn't last longer than a maximum of 2 years if the player is playing regularly (which he normally will because he has discovered something new and should be infected by the dart bacillus). Improving results will also work as additional motivation. Players who don't play much in this phase will rarely ever achieve a high level of play. If they don't like to play regularly here they are not "addicted" to the sport, and without addiction (or, at least, dedication) the will for being good simply does not exist. They will mainly form the stock of social players for the future, playing darts for fun and not for trophies. Not the right way to get good, but you will also never get into the difficulties of later phases. Phase 2 Shattered - or: The Catastrophy "The First Slump"
Here is the paradox of the phase that leads to the first slump: it is the most terrible of all phases, but a necessity to becoming really good. The more talented you are, the worse it will hit you. The more you try and think to get out of it the worse it will get. The higher your first peak was, the deeper your first slump will be. 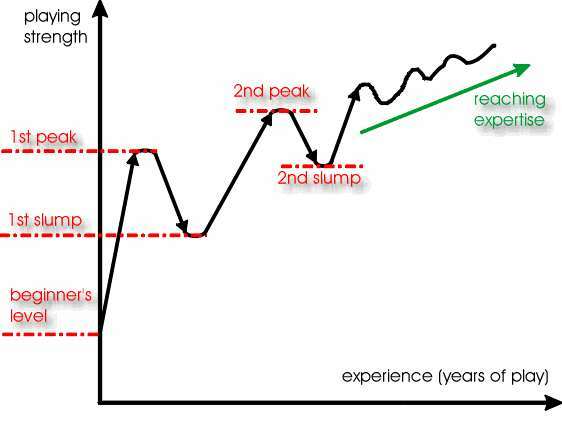 And to put the lid on the paradox, if you have a very high first peak and DON'T experience the first slump, you won't reach expertise because you will miss phase 3 -- the learning process. In phase 1, all was going easy. Improvement was everywhere, everything was fun. But then, marking the first peak, a sudden decrease in your playing strength occured. You couldn't explain it, and so you might have ignored it. But then it came again, or, at least there was no progress any more, and so you started to do something that should shatter your whole darting universe for the future: you started to think and you started to try making some things differently. The further progress you hoped for didn't come, so you again started to change something -- your darts, your stance, your grip. Then you found yourself playing worse than before. You wanted to go back to what you had done earlier, but for some strange reason this wasn't possible. You started to think again, changed another part of your dart, but it only made things worse. Welcome to phase 2. In phase 2 players realize that darts isn't the honeymoon they had hoped for -- easy and infinite progress without a limit in sight. You can put it this way: once you start to think about what you are doing, the carefree mode of phase 1 is gone. Please don't be shocked now, but it will never again come back. Darts as you knew it from your beginner's phase will be gone forever, but this is nothing to be worried about. It is a good thing. You did all things natural and easy, and you want this feeling to come back. Please forget that. You relied on things that worked unconscious. Not only is this impossible once you have started to reflect on what you are doing, it is also bad because with such a behaviour you would always be the passenger of your own unconsciousness. Isn't it much better to control things? Isn't it much better to react to your bad day and to know which things to change when something's going wrong? Phase 2 is the phase of searching. It is made worse by the fact that valuable information on darts is hard to find. What do you know about how a dart technique should be? And, do you know this or are these just thoughts of someone you believe in because she throws better than you (this www project is done with the intention of putting reliable info on such subjects online, so if you trust me visit the technics section)? The whole nuisance of the necessity of the phase 2 paradox is mainly due to this lack of information about darts, combined with the lack of trainers. If you would have learned from scratch with the help of a trainer (like you would for tennis or skiing, for example), phase 2 would still exist but would be less dramatic because you would know that your technique was okay -- your trainer would have told you what to do and what to avoid. So you are on your own, which mainly means you must problem-solve by trial and error. Okay, enough of my trainer lamenting. It won't help you much. What will help you is to continue searching, and to continue practicing. Be aware that trying too hard is a poison in our sport. Darts needs touch, not sledgehammers. Take it easy. Accept that some feelings in phase 2 are just depressing and some thoughts are mindblowing. Don't forget that you are playing a game you love. And, most importantly - DON'T QUIT!! I'm telling you this because I am a person who has gone through a terrible phase 2 and knows what thoughts there are. But now that I know that after phase 2 comes the "enlightening" (but also tough) phase 3, I don't want to miss the first slump any more. Players who didn't get beyond phase 2 have probably given up darts or decided that they are not made for the title Master (phase 5) or Bachelor (phase 3) of darts. Many are happy playing socially, but among these "phase 2 social players" there is a group of people who are slightly depressed by that fact, because they really tried to practice hard but the effort didn't pay off. If you are among this group, I want to encourage you not to give up your personal dream you might have in this sport. If you have the time and the guts to practice hard again to achieve your goal, it is possible -- phase 2 is not a one-way-street, it is a necessity to become a really good thrower. Maybe not as a master, but a bachelor isn't bad at all. Dia 4: Third phase - "Hard Work"
Finally, you managed to bring phase 2 to an end, and you have not quit the game you have shown dedication for. Congratulations, this was not easy. As a reward, the Bachelor of darts is awaiting you. Phase 3 is the real learning phase. As you see from diagram 4 (where the original flat progress is zoomed out to a more realistic fever pitch), it is a sequence of ups and downs, but a clear trend up is obvious. Some players still quit or give up their hopes here, but from all you have read so far I hope you are encouraged to work through it. In fact, while searching was the word for phase 2, work is the word for phase 3. During this search in phase 2, you have found numerous things that didn't work, but you have also found a few things that did work, otherwise you wouldn't have been able to enter phase 3. On the other hand, if you continue searching you will find at least something, so the progress into phase 3 is natural and inevitable if you continue searching (read: practicing). In phase 3, you still are on the searching side, but it is not any longer the blind flight you were experiencing earlier -- you are getting a feeling for the direction. It is still trial and error, but you can already estimate the outcome of your experiments. In some cases you will still be proved wrong, but now this directly adds to your experience and knowledge of the game. You are on the right course, and you should also feel and think this. In the end of phase 2 the bachelor degree awaits you with the 2nd peak (see Dia 1), which is now considerably higher than your first peak. Your consistancy has also improved because now you know what to do when things feel wrong. You are able to work in the right directions when you feel a problem during warmup for a tournament (of course you know in this phase that warming up before a match is important), and you have developed "emergency routines" when things suddenly start to feel bad in a match, and these routines already saved you in matches. If you don't know what I am writing about here then -- once again -- don't be frustrated. Although you might doubt that you will be able to reach this state of the art, I promise you that once you have entered phase 3 and continue with serious practicing, you once WILL understand what I'm talking about. If you are here and you work, then progress comes naturally. It can last a year or two (it can also last three years or four), but at this stage the benefit is already inevitable. With the Bachelor Degree now in hand, an unpleasant but short surprise can await you: The Second Slump. Don't be afraid now, this second slump is much much less dramatic than the first one. Now you have the experience and knowledge what to do in this case, you only have to stay calm and do what you have learned during phase 3. See the diagram. The 2nd slump is not that dramatic. It will only put you back in the region around your first peak. Didn't you dream of this situation when you were in phase 2? There is no use in chickening out in phase 4 (to chicken out is by the way the only danger that occurs from it). The second slump is a short period. If you are lucky, you won't even experience it, or experience it as the first of the many small ups and downs you will find on your way to expertise. Phase 4 can be seen as a time of consolidation. You should be among the tougher shooters in your league now. People will know your name, and this will be good for you because from now on you can win matches "by reputation" on bad days, which means that you are feared by phase 1 or 3 players. Players in early phase 5 should be on your hands if they don't take you seriously, especially when you are in the upward part of Dia 5, after you have defeated the second slump. By going through the second slump you will get even more knowledge about the game, getting more and more consistant. You have gone through the worst in darts, and it is time to practice for mastery. Phase 5 Go for it! Once you are here, slumps are no longer on the agenda. The only thing that happens naturally are slight ups and downs. In a down you are in danger against phase 3 und 4 players who are not interested in losing to your reputation. (phase 1 players might be tricky sometimes because it is possible they don't know you!). In an up you are starting to challenge the big names for the master of darts. The key word in this phase is consistancy. 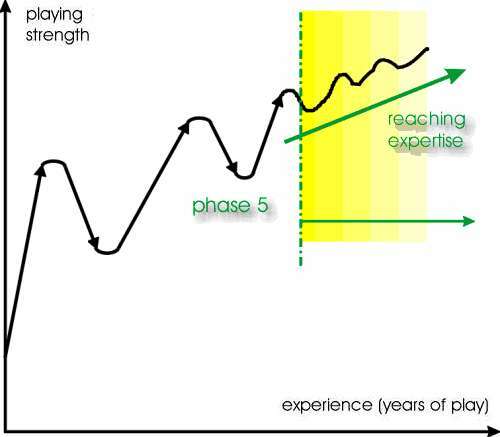 It is possible that you don't have the playing strength for battling with the big shots, although you are in phase 5, but the clear sign you are reaching expertise is not necessarily playing strength, it is consistancy and the fact that you have gone through and mastered all the other phases. You may lack the talent or youth to become an expert, but you can be sure that you possess all the necessary knowledge. If you are not busy giving the experts a hard time in tournaments, you fulfill all the requirements to become a respected trainer. The sport needs them (see lamento above). As always - feedback welcome! First, I want to thank Anthony Korahais, who has been diagnosed "First Slump Problem" by email lately. He provided the initial spark for this article. Second, I want to apologize for the lack of humor in this article. I hate referring to this article as being "unusual" for TDT (I've had too many surprises about what was coming out of my keyboard as a TDT article to any longer name anything of that stuff "unusual"), but I think in some point it is -- it contains more philosophy and rambling than actual advice, and it is unusually long; maybe too long for the fast-paced web. I didn't want to hyperlink the article in different online documents because this stuff shouldn't be browsed in handy pieces -- it should be read. Anyway, I hope you still like it, although the diagrams might be tough to view in any resolution under 800x600. Third, the sport needs trainers for being taken seriously. WDF, BDO, ADO and how all you organizations name yourselves, write this in your diaries, on your X-mas cards, wear T-shirts with this written on it -- and just generally, take this into account. The talents need them. And finally, fourth - those of you who think I've gone completely nuts now with this article can be assured: I'm not more than I've ever been.